If you have a combi boiler type heating/ hot water system the boiler should fire up when you turn the heating on or turn a hot water tap on. A combi boiler is a closed system which is slightly pressurised. The boiler will only fire up if the pressure is correct. There will be pressure dial on the front of the boiler. 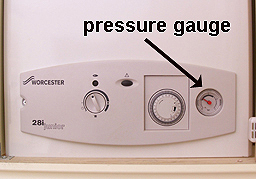 Check with your boiler instruction manual to see what the pressure should be for your model. It's often between 1 to 2 bar pressure. If the dial is reading low you need to top up the system with water. You should see an inline valve on the incoming water pipe. This will either have a small handle on it or alternatively simply a slotted valve which requires a screwdriver to open it. Open the valve carefully whilst watching the pressure dial. It won't take much at all to get the pressure to the required level. Be very careful you don't over do it. 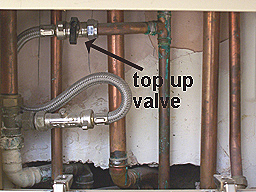 And make sure you turn the valve off as soon as the required level is reached. NB a valve is normally closed when the knob/screwdriver slot is at 90 degrees to the valve and fully open when in line with the valve.